Philadelphia 76ers forward Robert Covington high fives fans after shooting a three-point basket against the Dallas Mavericks during the fourth quarter at Wells Fargo Center. The Philadelphia 76ers' blockbuster trade to acquire All-Star forward Jimmy Butler from the Minnesota Timberwolves became official on Monday. 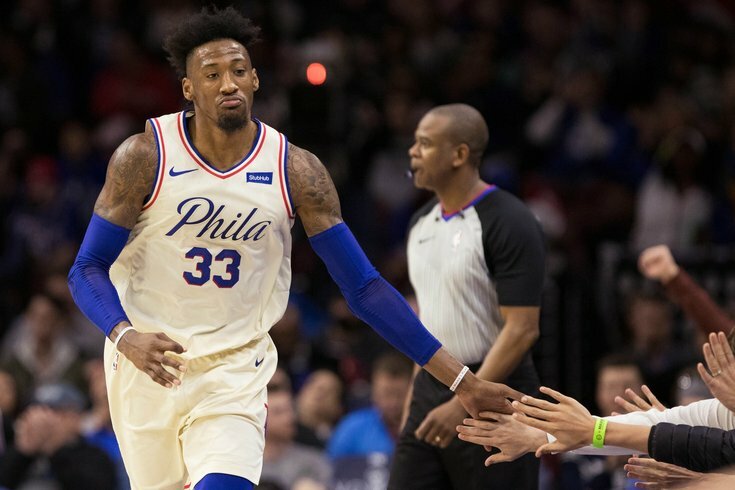 Landing a star talent on Butler's level came at a hefty price for the Sixers, who offered a package centered around Process-era fixtures Robert Covington and Dario Saric. Their departure from Philadelphia will be bittersweet for Sixers fans who appreciated the grit and personality both players brought to the team. Covington defied all odds to emerge from the NBA's developmental league as a legitimate NBA talent over his four full seasons in Philadelphia. In an Instagram post on Monday, Covington said his farewell to the Sixers and the Philadelphia fans. Just want to thank the city of Philadelphia and the 76ers organization for allowing me to grow as a player here over the past 4 years. Thru the ups and downs I learned a lot here and y’all always had our back. It’s been a incredible journey and I definitely wouldn’t change it for the world. I built friendships and bonds that will last a lifetime. Now a new journey awaits and I’m thankful for this opportunity. Until next time Philly!!! Saric posted his own goodbye later on Monday afternoon. A tweet from a Croatian sports account painted a tearful picture of the moment the news broke. This probably hurts even more for Saric's biggest fans. What ultimately matters is that the Sixers got the player they believe will help position them best to compete for an NBA championship. Butler will have an introductory press conference on Tuesday before suiting up with the Sixers for the first time Wednesday night against the Orlando Magic. Butler's reputation in NBA circles has become a question mark after he found himself at the center of drama on both the Bulls and Timberwolves. Not that Matt Barnes is an ambassador for NBA respectability, but he took a shot at Butler on Instagram the night before the trade went through. Time will tell whether the Sixers made the right call. You can easily picture Covington and Saric, both young players, having individual success elsewhere. A great start for Butler, who's pushing 30, would be demonstrating he can handle the competition and adversity of the NBA without antagonizing his teammates.